Hummingbird aggression: Fierce, deadly fights for territory, nectar, feeders, flowers. Ounce for ounce, they’re probably the fiercest creatures on Earth. Courtesy of Flickr user Dann Solo. Hummingbirds seem to be composed of equal parts bumblebee and electron, and they sport coats of iridescent feathers so fetching, you’d think every day was Fat Tuesday. They’re the world’s smallest birds, weighing less than nickels do, and they just seem so, well, adorable. But the Aztecs had a rather different view of these birds. According to legend, the earth goddess Coatlicue once picked up a bundle of hummingbird feathers that had fallen from the sky. Storing them near her bosom, she became with child. This angered Coatlicue’s other 400 children, so they conspired to kill her—but the moment they did, a fully grown, heavily armed, and mad as hell Huitzilopochtli sprang from her womb and started cutting off heads. Aztec origin myths aside, hummingbirds really are badasses. And there’s a biological reason why: Their lives depend on it. You probably already know that hummingbirds can perform all sorts of crazy flight maneuvers, like hovering in place and flying backward and even upside down. The little dudes have no problem drinking nectar out of a revolving feeder. These acrobatics push the animal’s body to the absolute metabolic limit for vertebrates. Every day in the life of the hummingbird is spent between the ruin of overexertion and the reward of nectar won. To make matters worse, they have a very low capacity for storing energy, and their small body size makes it difficult to stay warm. When it’s cold at night, some species have to go into torpor, a hibernationlike state. “They basically couldn’t survive eight hours without food or fuel if they were at their regular metabolism,” says Geoff LeBaron of the National Audubon Society. Anyway, to make this constant nom-nomming possible, hummingbirds come equipped with excellent spatial and temporal memory. They not only know where the nectar sources are within a given territory but how good they are and when they’ll become available, says Paulina González-Gómez, a research associate at University of California, Davis. If you take a feeder down and see a hummingbird hovering near the spot and think it’s glaring at you, it’s not your imagination. Males take all of this to the next level by establishing and defending territories. They’ll throw down with rival males, females, and their own reflection in a window. They’re also not above telling a bee to buzz off by giving it a quick flick of the beak or chasing a much larger bird out of their flower patch. 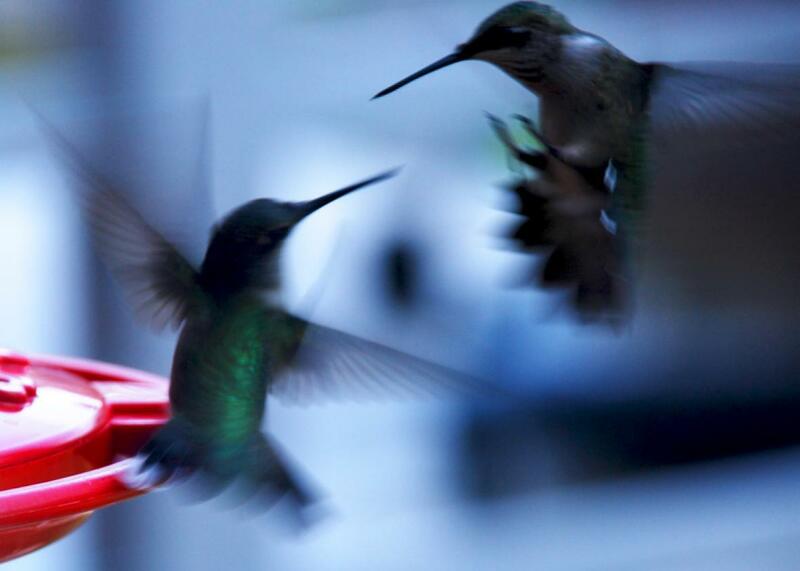 When hummingbirds fight each other, it usually involves chases and vocalizations meant to scare or simply harass the intruder until it goes away. Sometimes, these encounters escalate to grappling each other with their claws, though you’d need a high-speed camera to catch it. Sometimes, LeBaron says, fatal collisions can occur. At least one species of hummingbird, Phaethornis longirostris, actually has a beak designed to be a weapon. A study published last year by some of González-Gómez’s collaborators found that the beaks of adult males were like stilettos, longer and pointier than those of juvenile males or females—the better for stabbing other males in the throat. “I’d say that if hummingbirds were ostrich-size birds they would be extremely dangerous,” says González-Gómez. Interestingly, there’s a saturation point at which most aggression ceases. You can see it on display at any flower garden or aviary where there are more nectar sources than one hummingbird could reasonably defend. But the point is, he doesn’t need to. Hummingbird aggression costs a ridiculous amount of energy. If there’s a surplus of food, it’s pointless wasting energy trying to defend it. Aggression may also play into mating success for the males. Another study by González-Gómez found that higher levels of testosterone were positively related with body condition in Anna’s hummingbirds. González-Gómez says this could mean aggression is linked to mating success, since better-defended territories lead to healthier males, which would in theory be more attractive to females. However, the relationship between testosterone and body condition was less pronounced in other species, indicating that other factors play a role. Researchers are still determining just how all this sugar-rage fits into the birds’ life history, but it’s obvious that the male hummingbird is disproportionately confident for his size. LeBaron says he once saw a male hummingbird harass and sort of chase a golden eagle. “Which seems a little over the top,” he laughed. A screaming-freakin’-eagle vs. a bird about the size and weight of a Dum Dums lollipop. No wonder the Aztecs believed warriors cut down in battle would be reincarnated as hummingbirds—ounce for ounce, there’s probably no fiercer creature on Earth. And to think, you can lure these little war gods to your porch with nothing more than a red feeder and a little sugar water.